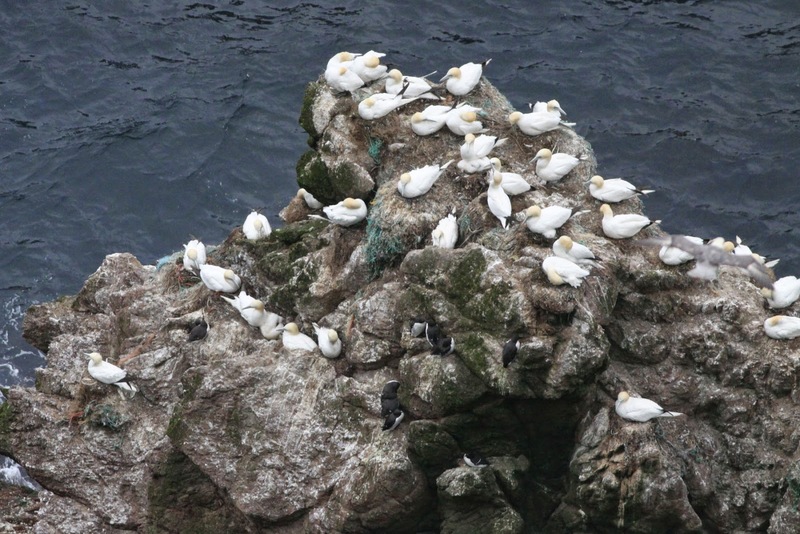 Fair Isle Bird Observatory: the Warden's diary: A New Hope: Fair Isle's seabirds so far. A New Hope: Fair Isle's seabirds so far. As most people will know, there have been a series of very poor years for Fair Isle’s breeding seabirds, reflecting the situation over a lot of the Northern Isles. On Fair Isle several species have declined quite dramatically (although none have been lost as breeding species) and productivity has often been poor (with some species producing no young at all in some years), with a lack of food the primary cause. 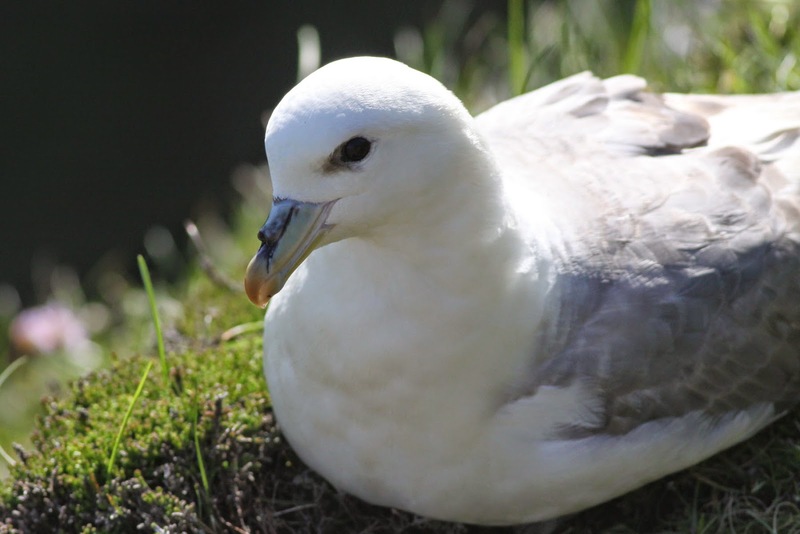 Fulmar - one of the later breeding birds, it’s too early to say much on how they’re doing, although the population plots seemed fairly similar to last year. Storm Petrel – no information on the breeding status, but the Storm Petrel ringing season has started well, with over 50 in total trapped in two nights in the Havens. A Leach’s Petrel was also caught, which, intriguingly, had been ringed on Fair Isle in August 2013. Gannet – a total island count of 3591 Apparently Occupied Nests (AON) is over 300 down on last year and may just be a sign of the population levelling off in recent years. 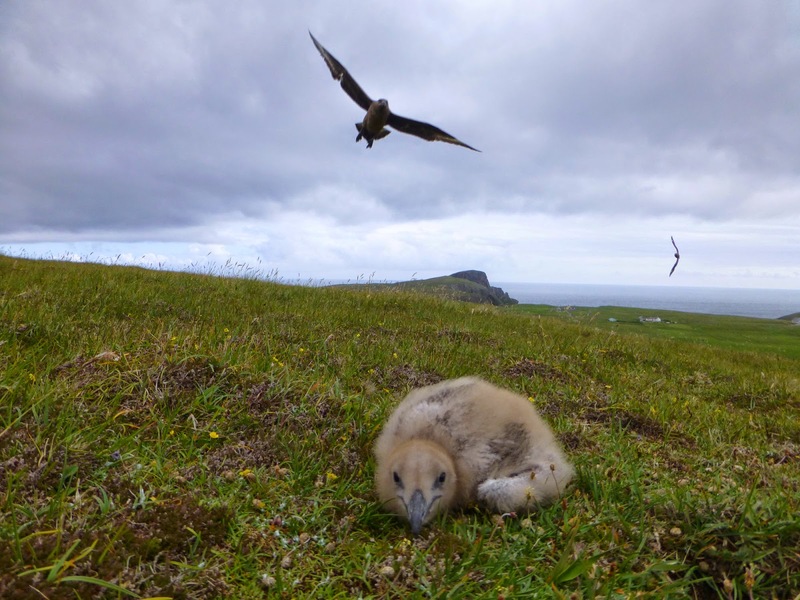 Productivity may turn out to be poorer than usual (although it’s still very early – the last chicks may not fledge until October) and a worrying sign has been several adults seen dead or dying, apparently coated in some form of pollutant. Gannets on Yellow Head, there are a few chicks visible on this picture. Shag – although the population is still at a much lower level since the 1980s and 1990s, there has been a slight increase in the population plot (to 24 pairs from 21 last year). Productivity seems fairly healthy across the island, with several large young now present in nests. 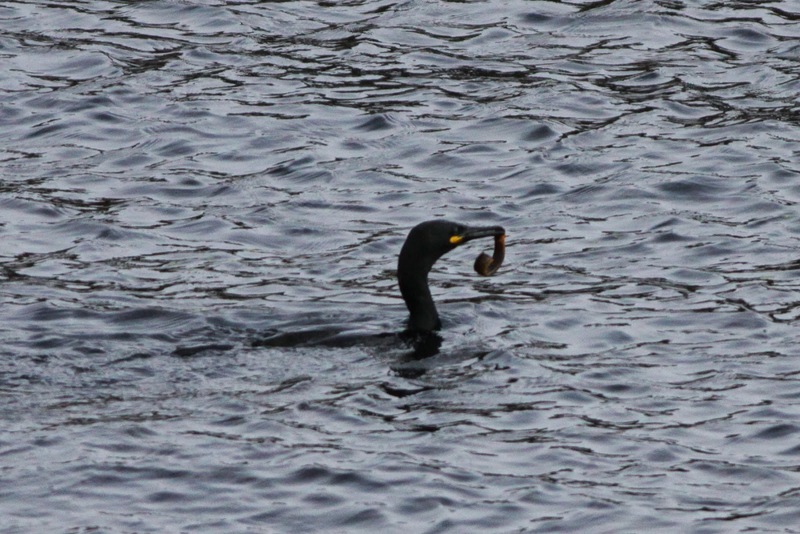 This Shag has caught a Butterfish, but it is presumably the availability of Sandeels and Gadoids that is helping the productive season we're having so far. Arctic Skua – a rare glimmer of hope for one of Fair Isle’s most beleaguered seabirds, as the number of Apparently Occupied Territories (AOT) has increased from last year’s low of 19 to around 26 this year. 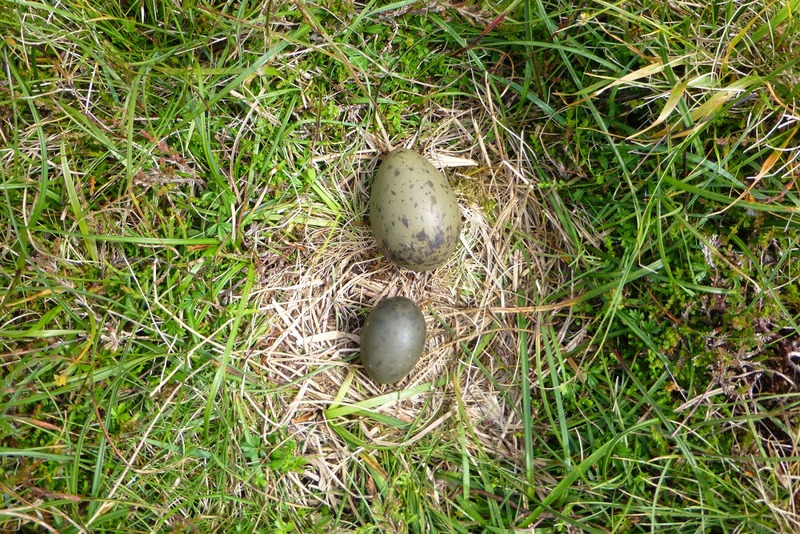 Of these though, several pairs have not laid eggs, whilst many pairs have a clutch of just one, indicating that the adults may be in poor condition. There is some hope of chicks appearing imminently, but it’s still a long way to go before it can be considered even a half-decent season for the Skooties. 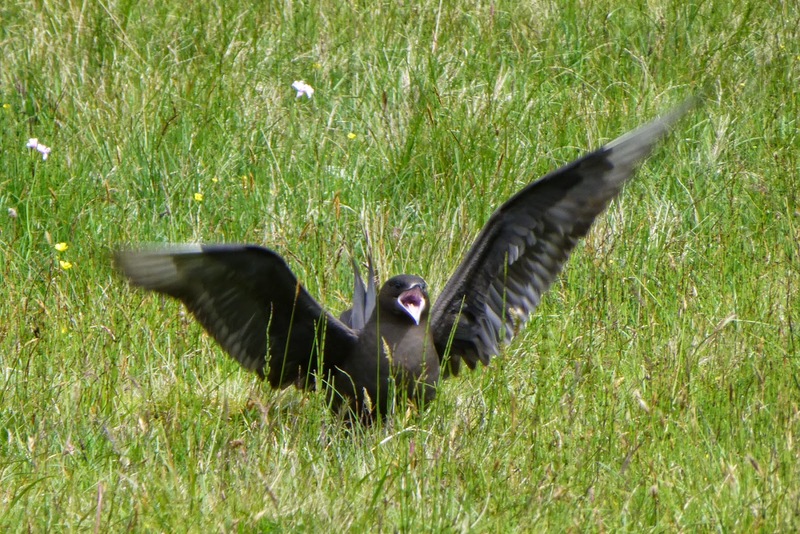 An Arctic Skua performing a distraction display. A sign that the birds may not be in the best of health included this clutch of two, one of which was a runt egg. Bonxie (Great Skua) - a record year, with upwards of 350 AOTs already noted (the final total is likely to be nearer 400). There are plenty of chicks now roaming the moors, whilst the adults have been notably more aggressive this year, suggesting that they’re in good health and perhaps even that they’ve a certain confidence that this is going to be a good season for them. A pair of Bonxies on Hoini protect their chick (the first to be ringed this year on Fair Isle). 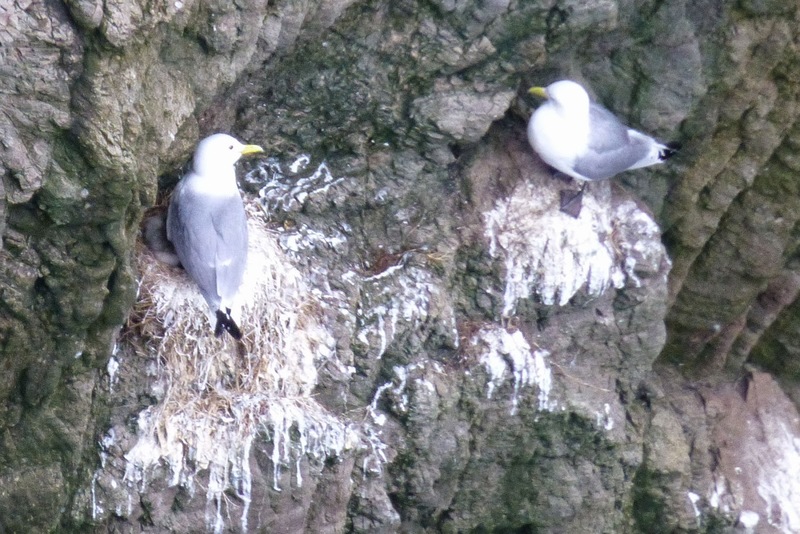 Kittiwake – a surprise resurgence (albeit a tiny one), as several years of declines have been reversed and the number of AONs has increased by almost 200 to 963 (although that’s still just a fraction of the 19,000 or so pairs that used to nest on Fair Isle). 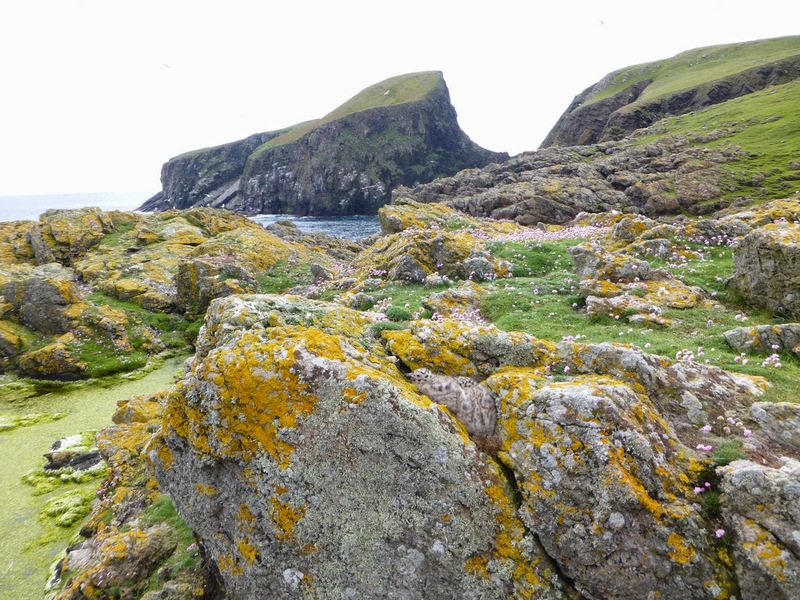 Productivity has shown a wee bit of promise as several nests have chicks – although the really crucial time is now coming up to see whether they can break a run of three consecutive years with no chicks fledging from the island at all. Kittiwake chicks just visible under an adult in Dog Geo. The number of AONs and Trace nests recorded this year more or less matches the number of loafing birds recorded last year. These little hints that many seabirds may not be breeding, but are still present, gives a little hope that we could see recoveries in even the most badly hit of populations if conditions improve. Other Gulls – Common Gulls appear to have fared badly in the small colony on Buness, with most nests having apparently been predated. They have managed to raise a chick to a reasonable size on Goorn though, and there is at least one nest down the island. The three large breeding species appear to be having a reasonable season with 55-60 pairs of Herring, 4+ pairs of Lesser Black-backed and 5+ pairs of Great Black-backed Gull all recorded so far. Herring Gull chicks on Goorn. Arctic Tern - 98 AON have been noted (up from 29 last year, but numbers in the last decade have fluctuated between 0 and 818 breeding pairs). Predation has been an issue though and, although some chicks have now hatched, it’s too early to say whether this season will produce any positives. 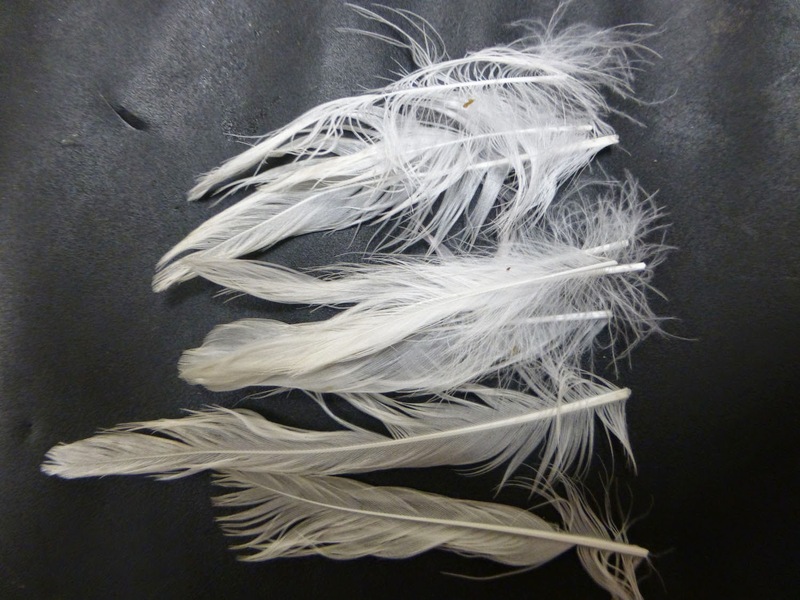 Although the predated eggs showed signs of having been taken by avian predators, a dead adult showed clear signs of cat predation (including bitten off feathers); for already hard hit seabird populations, this really doesn't help. Common Tern – a pair that have hatched three chicks on Shalstane are a pleasant surprise as the period 2006-2013 produced only one nesting attempt. Common Tern chick having been ringed. Guillemot – more (relative) good news, as the numbers in the population plots have gone up to 1354 individuals (an increase of over 400), which represents the highest count since 2010. There are also encouraging signs that there will be chicks fledging this year, with several now not far off. A 21-hour feed watch saw good numbers of gadoids and sandeels being brought in by the adults (tracking work has shown that the adults have only travelled as far as North Ronaldsay or nearer to collect food, rather than heading down to Fraserburgh as they have been in recent years, a similar situation to Razorbills). Razorbill – a small increase in the number on the population plot was welcome, but far more so has been the high success rate of the pairs that have bred. Several young have already fledged and it could turn out to be one of the most productive years in the last decade for this species. Several Razorbill chicks have been ringed and are ready to fledge. Tystie (Black Guillemot) – the population plot showed an increase to 196 breeding plumaged individuals, the highest count since the population crashed after 1997 and a hopeful sign that they are recovering on Fair Isle. Puffin – it’s too early to say much about how they’re getting on, although the last visit to Greenholm seemed to show that around a quarter of the nests have failed, suggesting a similar productivity to last year if the remaining chicks go on to fledge. Many have been seen coming in with decent sized fish (compared to the last few years at least), and we’ll have more details on that shortly, with Puffin food watches due shortly. No doubt there’ll be a few more twists and turns before the end of the breeding season (a day of heavy rain forecast for tomorrow may be the first potential hazard), but things are looking much more positive than they were by this time last year. Whatever you do to wish for luck, do it for our seabirds now please.